Dear visitors especially Muslim brothers, please take advantage of this night, from sunset till sunrise. Offer Nawafil (prayers), recite QUR'AAN, do repent (Istaghfar), and Pray for pardon, recite abundant Salawat (Darood Sharif & Salaam) and make benediction (Dua'as). 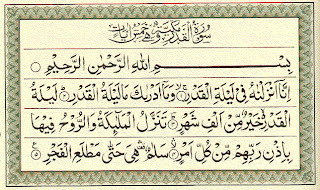 In each raka', after Surah FATIHA recite Surah QADR (Inna anzalna...) once and Surah IKHLAS (Qul-hu-wal-lah..) once. After completion recite SALAAT-O-SALAAM (Durood Sharif) seventy (70) times. Benefit: Insha Allah, Angels will pray for forgiveness for that person. In each raka't, after Surah FATIHA, recite Surah QADR once and Surah IKHLAS three times. After completion of this salah, recite any Astaghfar seventy times. 3) In this night (21st), recite SurahQADR 21 times. In each raka't, after Surah FATIHA, recite Surah QADR and Surah IKHLAS once. After completion of this salah (namaaz) recite the third kalima (Kalima Tamjeed) 70 times. After that, plead to Allah Almighty for forgiveness of sins. Kalima Tamjeed: "Subhan Allahi Wal Hamdu Lillahi Wa La ilaaha illal laho Walla Hu Akbar. Wala Haowla Wala Quwwata illa Billa Hil Aliyil Azeem". After Surah FATIHA, recite Surah QADR one time and Surah IKHLAS five times in each raka’t. 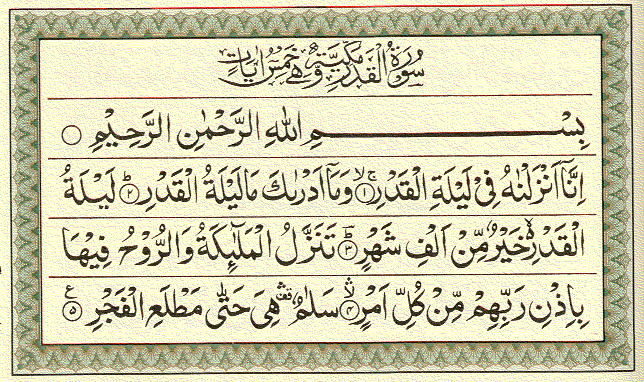 After completion of this salat recite the first Kalima (Kalima Tayyab) 100 times. Kalima Tayyab: "Laa ilaaha illal Laho Mohammadur Rasoolullah" (S.A.W). In each raka’t, after Surah FATIHA, recite Surah QADR three times and Surah IKHLAS three times. After completion of this salah, recite any Astaghfar 70 times. 3.Offer two cycles of ritual prayer (raka’t). In each raka't, after Surah FATIHA, recite Surah QADR once and Surah IKHLAS fifteen times. After Salat, recite the second Kalima (Kalima-e-Shahaadat) 70 times. Kalima Shaadat: "Ashadu Anlaa ilaaha illal Lahu Wa Ash Hadu Anna Mohammadan Abduhu Wa Rasoolohu". In each raka’t, after Surah FATIHA, recite Surah QADR once and Surah IIKHLAS fifteen times. After salah recite any Astaghfar 70 times. 2) Pray two cycles of ritual prayer (raka’t). In each raka’t, after Surah FATIHA recite Surah QADR 3 times and Surah IKHLAS 27 times, and plead to Allah for the forgiveness of sins. 3) Pray four cycles of ritual prayer (raka’t). (2 sets of 2 raka’t each). In each raka’t, after Surah FATIHA, recite Surah TAKAASUR once and Surah IKHLAS three times. 4) Pray two cycles of ritual prayer (raka’t). 5) Pray two cycles of ritual prayer (raka’t). In each raka’t, after Surah FATIHA, recite Surah ALAM’NASHRAH once, Surah IKHLAS three times and after salah, recite Surah QADR 27 times. 6) Pray four cycles of ritual prayer (raka’t). (1 set of 4 raka’t). 1) Pray four cycles of ritual prayer (raka’t). (2 sets of 2 raka’t each). In every raka’t, after Surah FATIHA recite Surah QADR once and Surahh IKHLAS three times. After salah, recite Surah ALAM’NASHRAH 70 times. 2) Offer four cycles of ritual prayer (raka’t). (2 sets of 2 raka’t each). In each raka’t, after Surah FATIHA, recite Surah QADR once and Surah IKHLAS five times. After salah, recite SALAAT-O-SALAAM (Darood Sharif) 100 times. In any night of Ramzan-Ul-Mubarak, after Taraavih recite Surah QADR seven times. Allah Willing (Insha’Allah), the one who does so, will be saved from all troubles and afflictions. On this great night it's of great benefit to perform Salat-Ul-Tasbih.